The Hyper ERP system includes a Bookkeeping Module which was designed to support the needs and requirements of the bookkeeping department with customized tools for effective work. 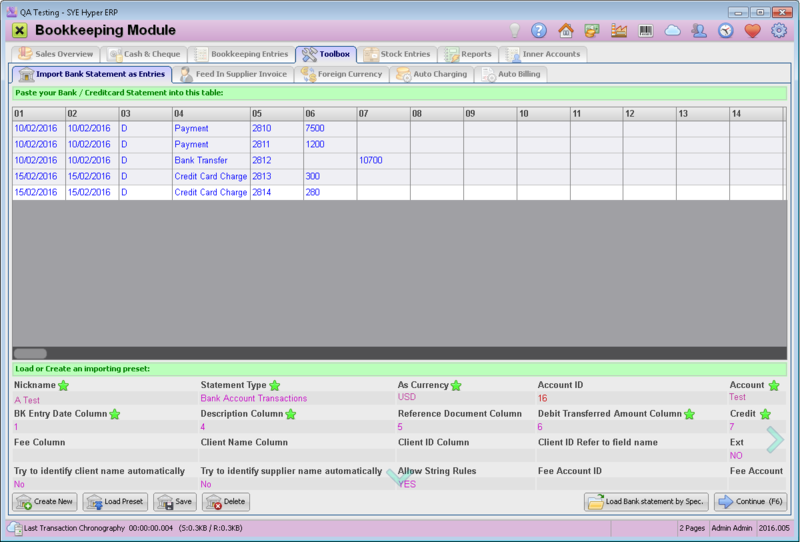 The bookkeeping Module provides the accounts manager with variety of required tools for the ongoing and daily activity. Import Bank Statement as Entries - This tool is used for updating the credit card and bank accounts transactions. This is the primary tab of the Toolbox and will be described below. Feed In Supplier Invoice - This tool is used for importing supplier invoices into the system, as well as for reporting a payment and producing a cheque. For further information click here. Foreign Currency - This tab displays the history of the currencies rates, according to required dates. The currencies rates can be manually modified or alternatively synced from defined financial sources. For further information click here. Auto Charging - The system allows to automatically charge all of the clients that have a credit card or a bank account details defined in the system ("C.C. Log & S.O." tab in the Client Card). For further information click here. Auto Billing - This tool allows to produce and print invoices for clients with renewed monthly services. For further information click here. 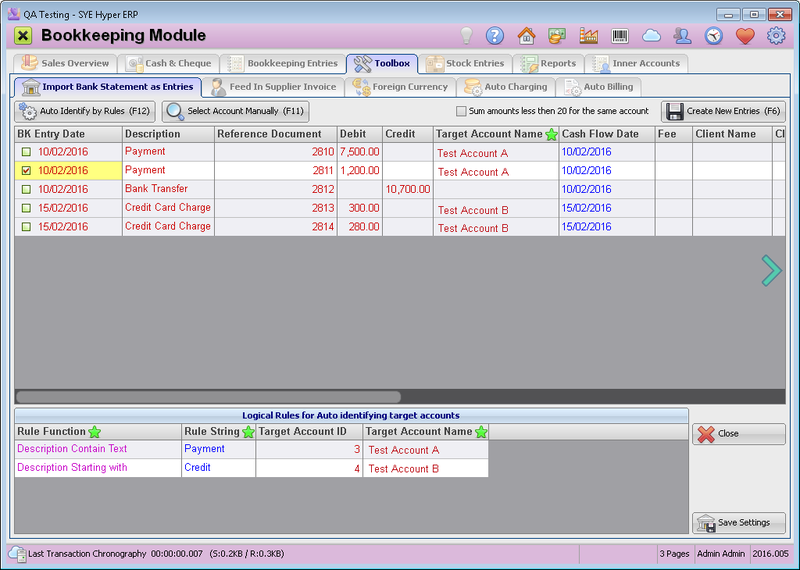 This tool of the Bookkeeping Module allows the user to import bank statements into the system. This action creates bookkeeping entries, quickly and efficiently, with no need to manually create the bookkeeping entries. The system allows to import the bank statements by pasting the data after copied from cvs file. Please Note - the data can be copied from any excel file and the fields must be identical to the defined fields in this tab (as described below). Copy the required table of the bank statement / creditcard statement / online payment system statement from the cvs file, by using Ctrl+C (do not copy the titles row). Paste the copied data into the table in this tab, by pressing Ctrl+V. Define the importing rules in the definition fields at the bottom of this tab. You can use an exist list of rules and load it by using the Load Preset button. Alternatively, create a new list of rules by pressing the Create New button. Pay attention to the columns numbering and to the "Date Mask" field. In order to make the importing rules (importing preset fields) available for future statements importing, click the save button. The system allows to automatically identify Client / Supplier. In order to make this option available, select "Tight Match" or "Soft - Phonetic", in the "Try to identify client / supplier name automatically" fields. Also, in order to allow the system to identify opposite accounts for transactions with defined opposite accounts, select "Yes" in the "Allow String Rules" field. This option will be explained below. After filling in the definition fields, press the Continue (F6) button. For "Credit Card Transaction" type of imported statements, a "Credit Card Transaction" window will be displayed, to define the "Payment Due Date" field. The statements table. In this table, the user should select the required target account for each statement. The system can automatically select the target account, according to the defined rules in the "Logical Rules for Auto identifying target accounts" table, as described below. For any statement with no target account, the system allows to manually select it from the accounts search wizard. In order to select a target account, mark the check boxes of the required statements and press the Select Account Manually (F11), to search for the account. Description Contain Text The description field contains the rule string text (also as part of a word). Description Starting with The description Starts with rule string text. Description is Equal to The description is identical to the rule string text. Description Contain the Word The description contain the whole word from the rule string field. Description Starting with + Space The description Starts with rule string text and has SPACE after that text. Description Contain ALL Words The description contain all of the words from the Rule String field (also in a different order). Choose the required function and fill in the "Rule String" to search for, in the statements description field. Select the required Target Account Name and press the Save Settings button. Use the Close button to go back to the previous window without saving the modifications. By using the Auto Identify by Rules (F12) button, the system will automatically fill in the "Target Account Name" field, according to the defined logical rules. By marking the check boxes of the required statements and pressing the Select Account Manually (F11) button, the Target Account name can be modified. Sum amounts less than 20 - If the same account has few statements with a total value of less than 20 (in the account currency), the system will automatically gather all of these statements and will create only one bookkeeping entry. Mark this check box to allow the system to gather the statements. After choosing the required target accounts, press the Create New Entries (F6) button. This action will create a bookkeeping entries only for the statements with defined target account name. The system will display the transactions that are suspicious as duplicated, and ask the user to approve / cancel it. Please Note - after closing this module, the system does not save statements without bookkeeping entries. Therefore, it is recommended to create bookkeeping entries to all of the statements in order to avoid confusion and miss statements. After creating the new bookkeeping entries, the table will display the statements that have no target account. Fill in the target account details, according to sections 6-9. Open the Account Journal to verify the balance of the target accounts and to bundle the bookkeeping entries.